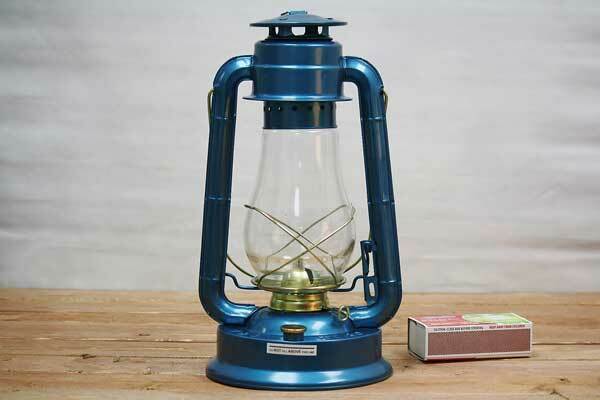 When you need a powerful light you can rely on this large hurricane lantern is for you. Intended for use both inside and outside with lantern oil approved for each purpose. A thumb controlled side lever lifts the glass chimney to easily light and trim the wick. The oil tank holds 24 hours of oil and provides a sturdy foundation that won't tip over. With the same tall-glass efficient build as the pathfinder hurricane oil lantern, the V&O Supreme old fashioned oil lantern is larger and more powerful. The traditional frame and authentic construction is inherited from the Dietz Blizzard Lantern. Although made with thinner metal than the Dietz Blizzard, this large hurricane lantern doesn't leak and will put off a lot of illumination. The glass globe can be cleaned and replaced on its tilting hinge. Made by V&O Lanterns.